My street looked very different this morning. Within a few hours enough snow had fallen to blanket the sidewalks and even the roads. This was unusual in the city where the snow never amounts to much, particularly in the downtown core. 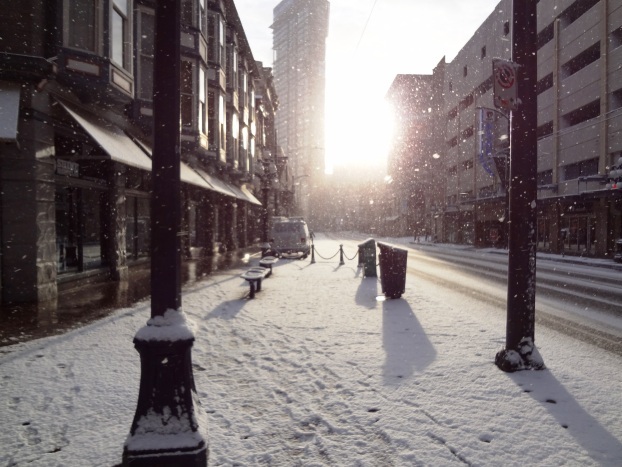 Big flakes of snow falling as the sun peeked around the corner of the buildings created a beautiful sight. In the time it took me to walk a couple of blocks the sun had burned off the clouds and brought back the blue skies. Within an hour only bits of snow hiding in the shade of the buildings survived the morning fall and anyone who was busily occupied inside a building may have missed the entire event. It reminded me how quickly things can change. In one moment I was blinded by the snow, covered like a snowman after walking a few blocks and then in another the snow had disappeared as quickly as it had come. It made me think about how we are also constantly going through change. Just like the appearance and disappearance of the snow our thoughts, feeling, emotions seem to appear and disappear with or without our attention or intention. 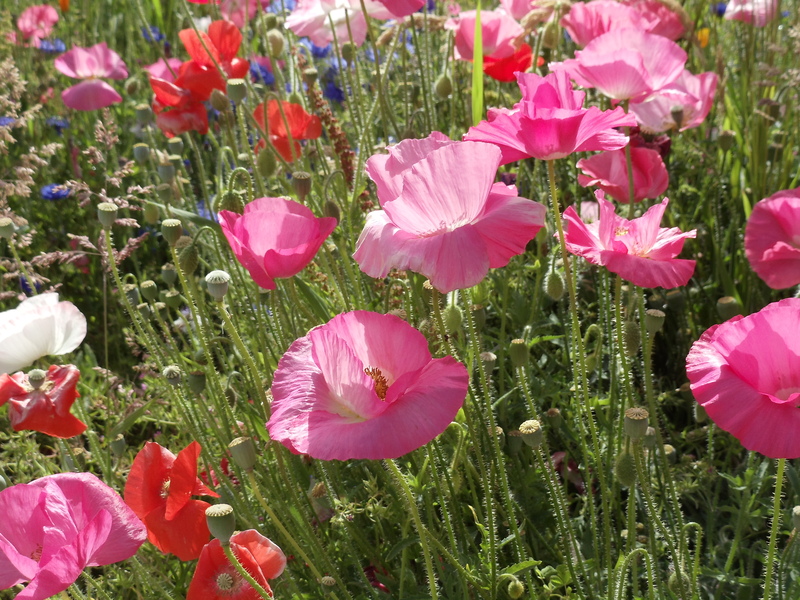 We experience continual change in some way or on some level all day every day. We change the ways we see things, what we see, the way we feel, the way we respond to things and we may or may not notice these changes. Watching the snow fall and then melt away made me think about how natural that process seemed to be. It just was. I wondered whether I would benefit from observing the changes that I experience in the same way, as a natural process unfolding before me on one level just to be observed, not judged or analyzed but just accepted as is. 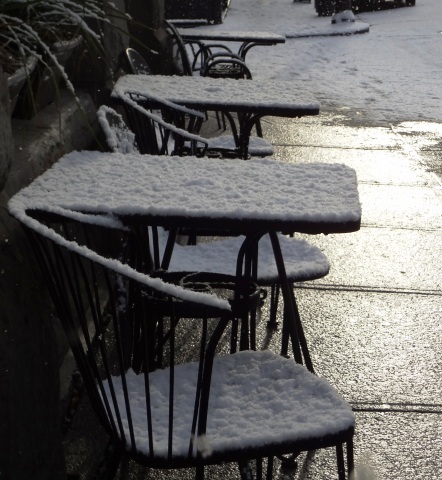 I thought about the beauty of the snow covered tables and chairs outside the cafe and wondered whether in our hurry to push through life we might miss seeing the beauty in change. The snow was on the tables and soon it would not be. The snow falling and then disappearing was another illustration of the flow that is so evident in other areas of nature and a reminder to allow and appreciate the flow in our lives. Flowing with the changes and not resisting while still remaining cognizant of our response and our influence on the changes we encounter provides us a chance to have a good experience with change, with life. The flash snowfall also made me consider how we can easily be fooled into believing that our perspective of the world is the same as that of others. My morning was unique to me but at the same time was shared by many other people but all of us walked away with a different reaction and response. Recognizing that each of has a slightly different view of the world can add to our ability to relate to others. Being able to see that everyone comes with a slightly different perspective gives us on opportunity to learn and to broaden our world view. Our different perspectives make life interesting. The snow has all but vanished yet the memory of the white snow covered streets has changed the way I am looking at this day and the way it unfolds from here.